More info from Tim on the button posted on the 30th. '15th Debyshire Rifle Volunteers . 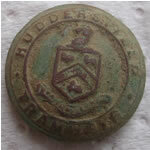 . .
Raised - 1860 to 1887 when it was renamed the 1st Vol' Batt'n Sherwood Foresters'. More unpublished finds out of the export pouches. Georgian watch winder with No 9 - Regimental issue ? 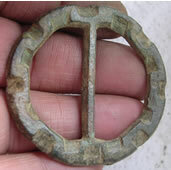 Terrets were used in paired draught to guide the reins from the horses mouths to the hands of the driver. 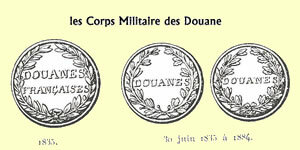 In total, five terrets form a complete set. All five were placed along the yoke, with the central terret being larger than the other four. 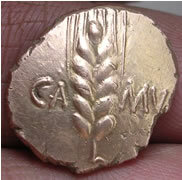 Probably first century AD. 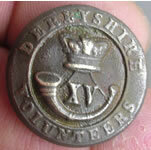 '15th Derbyshire Rifle Volunteers . . . 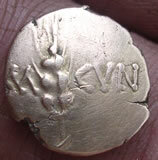 The guys have received their final valuation acceptance letters for their treasures so payment will be made shortly, more details posted on the members forum. 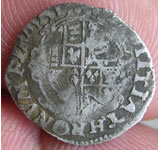 Huge up dates on a lot of the pages on the site including the foreign milled and hammered coin pages. 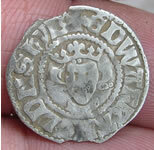 Swedish Yngve has up dated a load of ID's to the European coins. 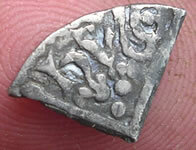 side would give the year (AH1236-1246) and the mint. 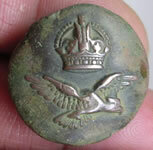 I have added all the info I can find so far on our POW site to a new page that has produced all these amazing button finds. I was not aware how large the local airforce base was and how some of the top USA aces flew from there during WWII. POW site page. 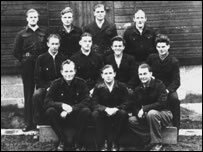 There is only an occasional reference to WWI POW's which appear to have been housed at the same location as the later airforce base. 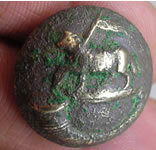 I have also added another page on the Hoxne Hoard, Suffolk farmer Eric Lawes discovered this hoard, while using a metal detector to look for a lost hammer. Thanks to the guys at the ARF is ID'ing yesterdays bullets., first one is Enfield .577 cal and the second most likely for a .44 cal pistol Try out this great bullet database they posted where you can enter size, shape etc to find the ID. 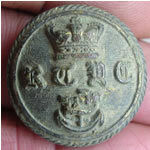 Robert from Poland has sent me an ID on the 10th Company German button and I just found a 12th Company in Chicago Ron's finds pouch ! 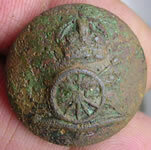 More regiments being held prisoner on our POW site. 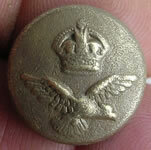 'Your button is German button between I and II World War. 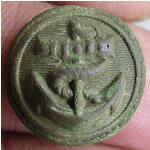 This number "10" means 10th company. 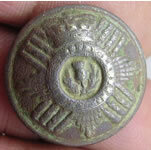 In most european country number from buttons means number of regiment. German's regiment had theirs numbers on badgets'. 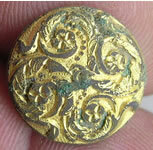 Just got a great e-mail in from a button collector in Poland that loves the buttons we find. 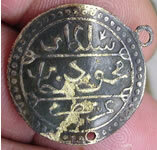 He has a great site with a huge collection from around the world and it is well worth a visit . www.guziki.radwan.pl .Guziki in the polish language means buttons. Chicago Joe just sent me a great testimonial of his Barn House stay which I posted on the testimonial page. Still beavering away on the exports but progress is slower this year as there are just so many great buttons to clean up and post. 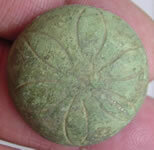 Buttons are a great relic as they are so diverse and you can ID and date them fairly exactly. 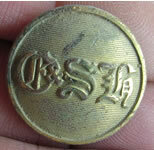 A couple of the livery buttons below have unlisted manufacturer's. 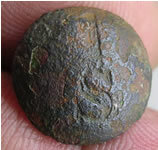 Musket balls are a common find but later lead bullets are a lot rarer find so I have sent two off to ARH forum to see if they can ID them. 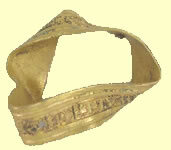 I am currently reading an amazing 'Treasures of Sutton Hoo' book by Robert Hale written in the 1970's. 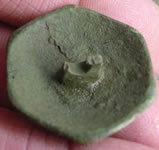 The discoveries made are truly astounding so I have added a quick overview and pictures of some of the finds on a new page Sutton Hoo. 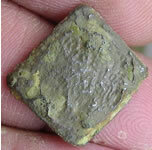 Sutton Hoo is around 25 miles NE of here and the gold coins found there are interestingly the same Merovingian gold tremissis as we have found here. 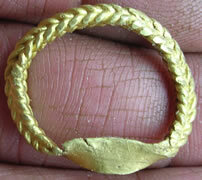 Another existing page has the Gold Torcs found. I have just got back Dale VA's export license for his gold prize for winning this years forum competition so it will be on it's way to him Monday . Next seasons prize is going to be a biggy and your chance to win a free weeks fully inclusive full board holiday, you just have to get here. 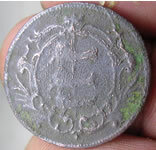 The competition is to guess the number of hammered silver coins that will be found from Sept 2007 to April 2008. Guesses must include a date and time to be valid as guys will guess the same number. Check out the forum comp page for those eligible to enter and for more info. 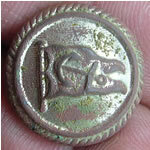 More info from Tim on that earlier Austro Hungarian Navy - Pre-WWI looking button. 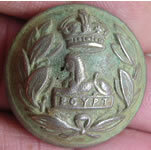 'Further research on this button reveals this button appears to be relate the French 2nd Empire. 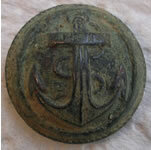 My sample is of French Maritime Customs. Note the similarity'. 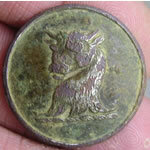 I have finally managed to ID two outstanding trade half pennies. Fascinating that they were barber/surgeons. 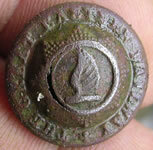 Tim has sent me a better ID on an earlier French military button find. 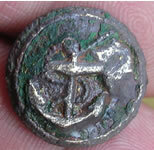 The 3 treasures that had their inquests held on the 28th March 2007 are now going forward to the valuation stage. Click on the letter for full size image and you can see that the committee meets today the 16th May. 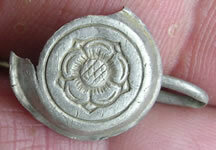 Pennsylvania Christy's 17thC silver button feedback is interesting as it is the first one of that type they have seen. 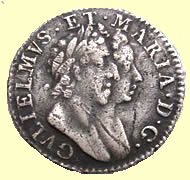 Note the clasped hands above the heart and thought to commemorate the marriage of Charles II. 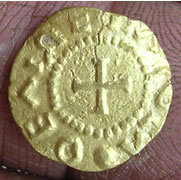 More details on members area and updates on Hoard and Treasure page. 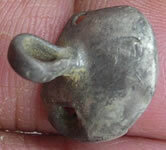 I reported our 5th medieval silver hawking bell fragment to the museum as treasure yesterday from the same area of land we have been detecting since Sept. 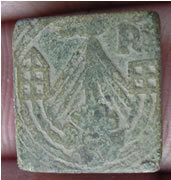 This spot was the village recreational area since the 13thC so it looks like hawking was a big form of entertainment. 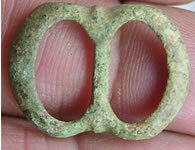 The only complete bell so far was found by Ohio Eric several years ago. 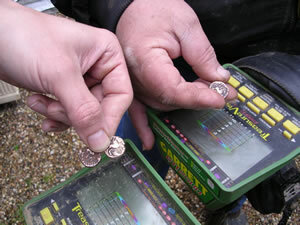 New for 2007 is the introduction of training days and weeks for those that want to try out detecting for the first time or want want to improve their find rates. 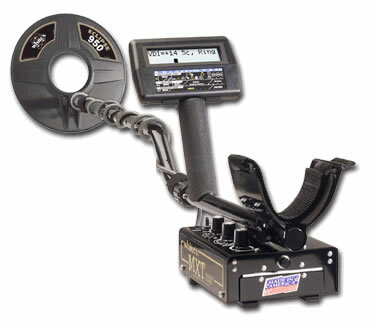 I have purchased 2 more brand new Fisher Coinstrikes, my machine of choice and 3 more Whites MXT's, some of the most successful senior members machines of choice. 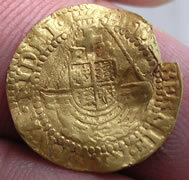 We also have another very successful machine at finding Celtic gold a Garret 2500. 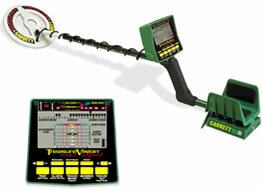 The weekly events are run by our detector machine expert Gerry from http://www.gerrysdetectors.com/. 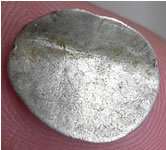 Gerry who has over 30 years experience already runs regular training courses in the USA on the use of machines locally and also at Ganes Creek Alaska looking for gold nuggets. He has detected in the UK several times with impressive results so I approached him to run these events. Some of our senior members here have attended his courses with great success and improved find rates. 2 - One week training weeks are reserved for the 2nd to 9th and the 9th to 16th of November staying at the Barn house accommodation. 6 slots per week are available and will be run if there is sufficient interest. These are aimed at complete novices or improvers and all kit is supplied. 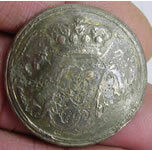 Two disclaimed treasures have been picked up from the British museum on Thursday and will be returned to the finders, more details on the members forum. 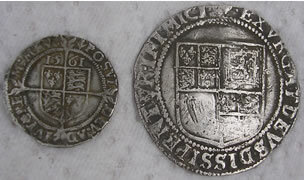 'Quarter Farthing - The smallest denomination ever struck in this country. 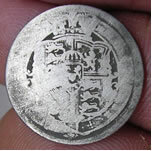 There were 3,840 of these coins to the pound. 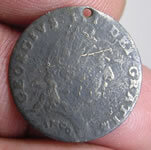 They were issued by Victoria and struck in copper; they are scarce'. 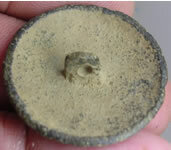 Some real interesting buttons with unknown fronts and markers marks sent off to our button expert Tim for his views and another treasure of a Medieval Hawking bell fragment. 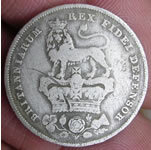 M.M Collier.Neal Maker to his majesty ?? I have archived some of this page to reduce loading times. 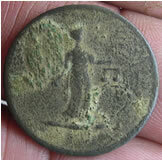 I have been working closely with Tim our button expert to ID a lot of the unknowns on all the button/badges pages. 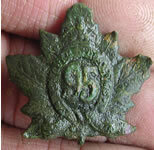 This 95th badge find turns out to be a Canadian 95th Battalion . 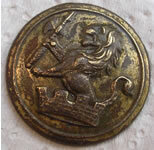 A button I thought was just a nice livery button with Lions and Hearts could be another European regiment so I have sent it off to the guys on the French forum for their opinion. 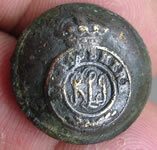 Just ID'd as an early Danish Army button. The forum is down at the moment http://forumer.com/fap/fstatus.php We are on Server 7. 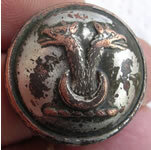 Tim Burton our military and navy button expert has officially joined the club as an associate member. 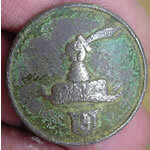 Tim who has written all those great on line books we use is also after purchasing any buttons etc any member has doubles of or wishes to sell. Drop me a mail if you have any that you wish Tim have a look at. 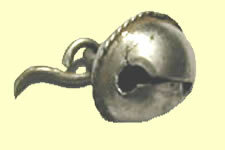 A slightly convex symmetrical mount with lobed ends, transverse ridges, and two integral pointed lugs. 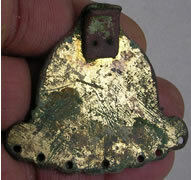 Intriguing piece - decorated triangular top - all 3 edges are also decorated. 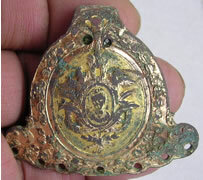 No idea what it was used for other than a decorative mount. 45,58 mm L ??? During the preparation of paperwork for export licenses every item is looked at again individually. 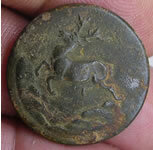 Any missed items while the hunts are underway are recorded and photo's uploaded to the site. 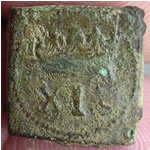 All finds must be photo'd and itemised as part of the export process. 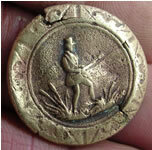 Below is Idaho Gerry's export pouch as an example, boy did this guy dig like crazy with over 200 buttons dug alone. 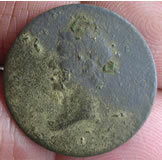 I have photo'd and posted some of his nicer buttons below. 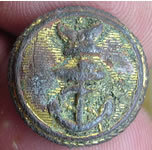 One appears to be an early US Navy and one is similar to an early Navy surgeon/ hospital ship type which I have sent off to our button expert for his views. 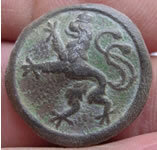 More great buttons off our POW site cleaned up and a great ID by the guys on the French forum of those Rampent Lion buttons we have been finding. 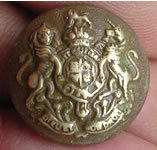 They looked initially like livery buttons but the numbers found and the construction matches the Bavarian crown buttons and they have been ID'd again as WW1 Prussian. 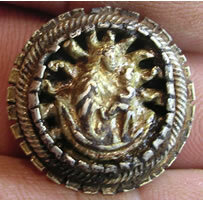 I found this info on the web and it states this guy used the rampent lion as opposed to the crown type. 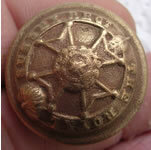 As metal become scarse at the end of WW1 the buttons are made of cheaper material. 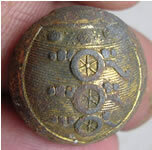 A French coin expert Com latrebateen (identifications du forum expert) has added further information to the Saxon gold coin found a few weeks ago and has this line drawing of a similar one. 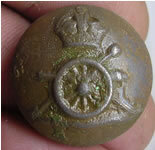 Yesterday's Paris back mark button is ID'd by the guys at the French forum as French artillery after 1914-18. 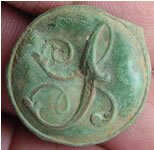 Tim Burt our button expert has also been helping with yet more ID's. 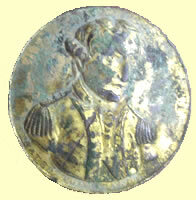 Another earlier medallion find is not Nelson as first thought but Earl St Vincent as seen on the copper medallion below. 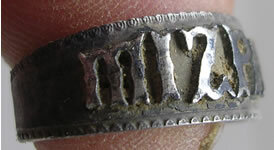 A silver ring find with the word 'MIZPAH' is a Lodge item . . . The Shriners. 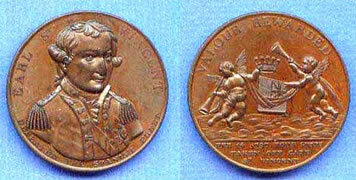 February 14th 1997 marked the bicentenary of the Battle of Cape St. Vincent, the first of the important series of Horatio Nelson's naval victories leading up to the bicentennial of the Battle of Trafalgar in 2005. 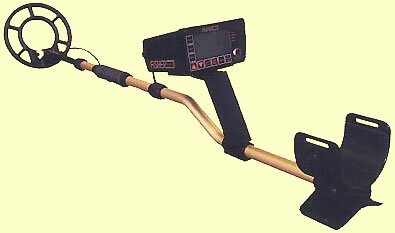 Member Idaho Gerry runs training courses in the use of detecting machines and I was very impressed with his 30 years experience and the results he has achieved especially with the ability to find gold nuggets . 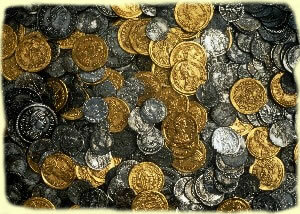 Ark Gary attended his gold hunting training 4 years ago which might account for his phenomenal success at finding 12 gold coins over here and the last Saxon gold coin. 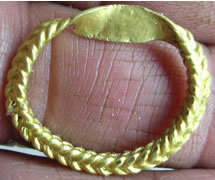 There is a real skill and technique required to find 1/4 Celtic gold staters as they are such a poor tiny target. 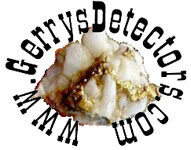 Gerry has a web site http://www.gerrysdetectors.com where you can join these events in the USA. 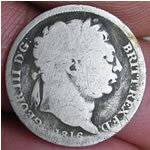 As a member he is offering great deals on new machines on the for sale part of the members forum http://essex.7.forumer.com/. Contact Gerry directly if you are interested as you don't have to a member to get the deals. 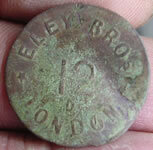 Myself and Mark are still getting out detecting for a few hours while there is land available on our POW site. 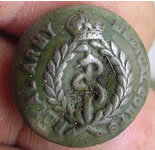 The numbers of military buttons being found is still amazing and the earliest copper coins date to 1670's so far. 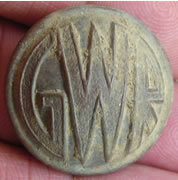 We got RAF, USA GI, another load of 1880 Prussian type, 1890 pattern General service but two really neat Tram and railway buttons. 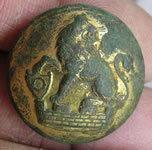 We have found a whole bunch of Lion buttons which I though up to now were just nice livery buttons but I am not so sure. 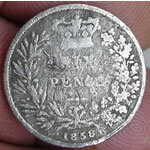 They have the same variance in construction and metal types as the 1880 Prussian type so are they military ? 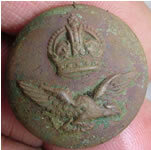 I have sent them and the 'Pari's backmark military button below off to the French forum to see if they can ID them. 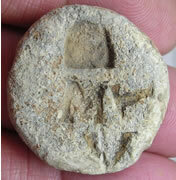 Mark also cleaned up a load of earlier ones and made such a great job that I can now ID the back marks. 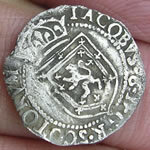 Updated all the hammered silver pages with the latest finds and added a new page for Scottish and Irish coins found here. Updated the Military and Navy pages with new ID's. 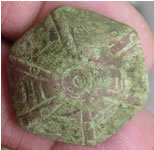 Took a break from the export paperwork and got out for a few hours detecting on our POW site. 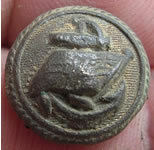 A great bunch of buttons found including some more 1880 pattern Prussian and 1890 pattern general service issues. 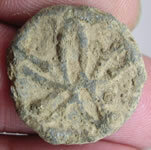 A interesting find was this later period 16thC lead token with petal design. 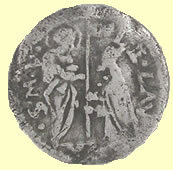 3rd place the Saxon gold coin. 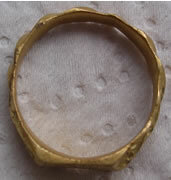 The ring as expected was declared Treasure at the Coroner's inquest on the 28th March 2007 and is awaiting the valuation committee's stage of the Treasure Act. 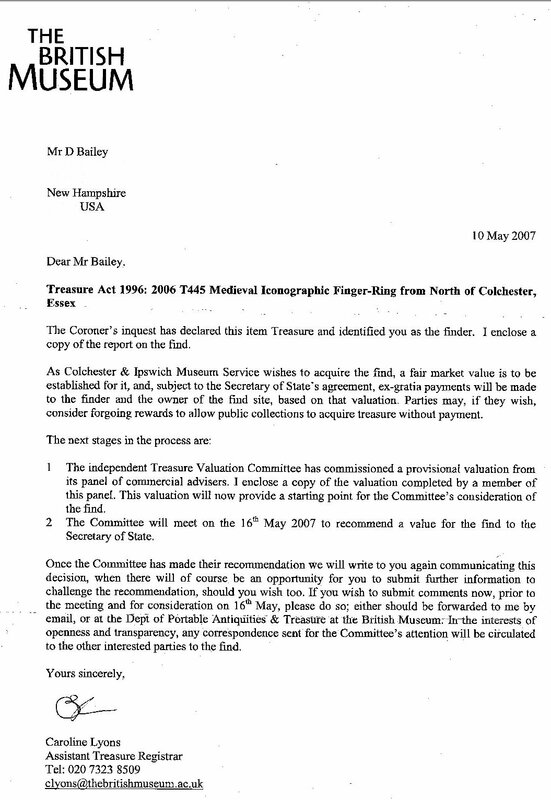 Colchester museum have indicated that they want to acquire the item but it all depends on the final valuation if they wish to purchase it, if not Dave will get it back. 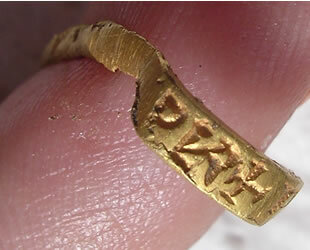 Below is the letter from the British museum ID'ing this amazing find. 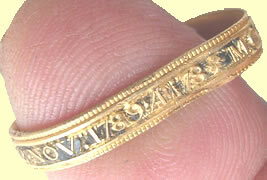 The five petal flower on the ring represent the five wounds of Christ and the number 7 may be an allusion to the seven sorrows of the Virgin Mary. 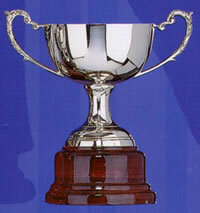 Dave wins the free weeks holiday next season, the Silver urn and his name on the shield of honour. 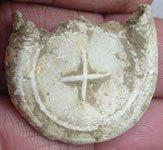 We are starting to get a good set of USA finds mostly from the front of the old churches and the POW areas. 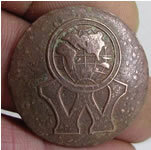 I have added a new page USA, Aussie and Canadian finds and have also added a possible CSA button find that was in a guys export pouch. 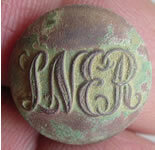 I missed it thinking it was just a nice monogrammed button. 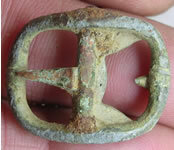 I have posted it onto the USA relic forum to see what they think it is. 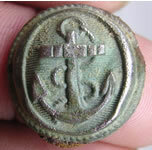 Tim Burt is still updating our Navy and Army button pages with correct ID's. 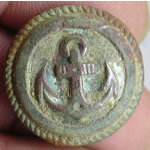 Some interesting one's like this 1870's French Navy button. 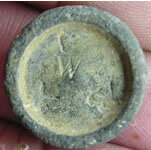 Thanks to Tim Burt for ID'ing another set of our buttons found this season. 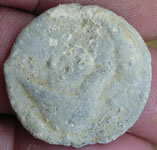 He has just sent me his revised set of on line books that include some of our button finds. 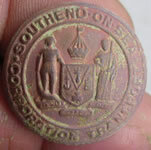 Being near the main Port of Harwich and the Colchester Army garrison gives us a very diverse set of both Navy and Army buttons. 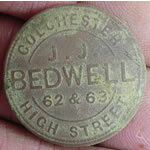 The prize of the buttons sent to Tim to ID has to be this rare local Colchester button, great find. 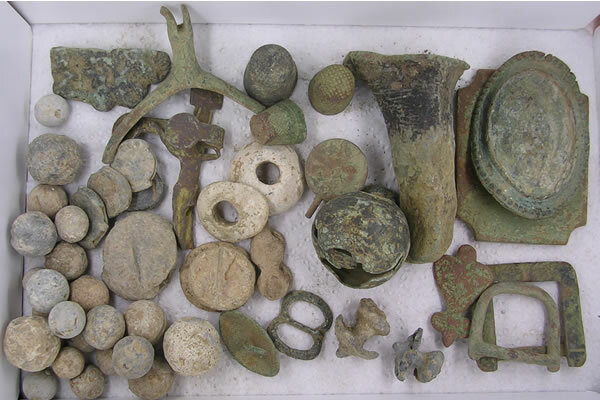 This was an outstanding season in terms of number of artefacts and coins recovered with 12 artefacts reported to Colchester museum as potential treasure. 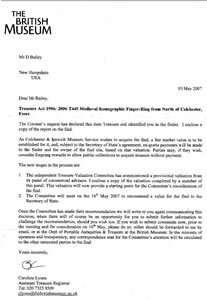 The museum has shown interest in purchasing 5 items under the Treasure Act and the Coroners inquests have been held for the majority of them. Two new sites of about 40 fields were added from Sept 06 and these took 50% of our resource this season in attempt to hot spot them. 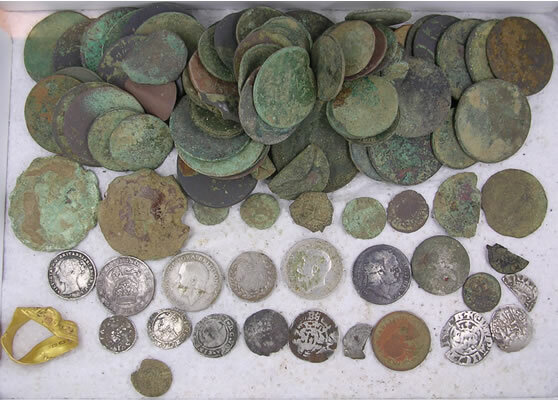 We found another new Saxon area with artefacts and a single Saxon silver coin but his site is massive and will require a lot more work to realise it's potential. 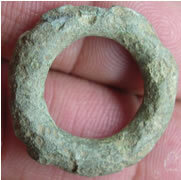 The most important new area we discovered is another Celtic village where the rare Celtic gold and silver was found. This area covers 17 fields and has a Beaker people excavation at it's centre and Canadian Rod's extensive research uncovered a chieftain burial and Torc found in the 1950's. 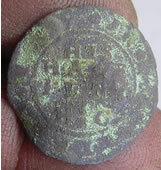 The amazing discovery by Dr Philip De Jersey from the Celtic coin register that the first Celtic gold coin ever found here 4 years ago matches the die type exactly of this latest one found 5 miles away. 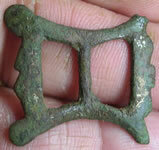 Both these Celtic villages obviously worked closely together (see post 14th April). 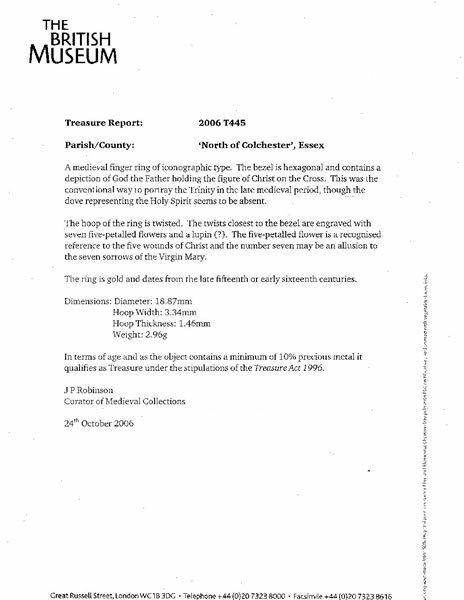 Philip is using the information we have reported to him to form part of new book he is writing on Celtic Hoards found in Britain. 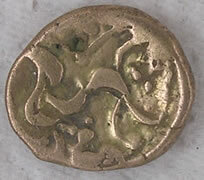 We have now registered our 60th Celtic gold coin with him since we started. 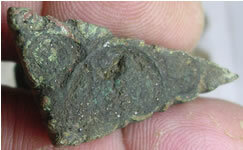 An interesting figure is 60 gold, 4 silver and half a dozen bronzes have been found here. 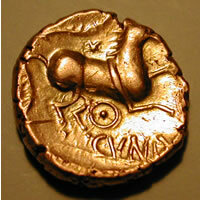 The Colchester area is well noted as having a disproportionate ratio of gold to other coins due to the wealth of the tribes here. 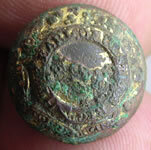 Our other 15 sites again produced very important finds including another Saxon gold coin found by Ark Gary with only one other of it's type existing in a French museum, great find. 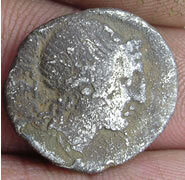 Mass Mike found the second oldest coin ever found here a Roman Republican silver at 108BC. 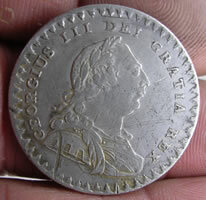 That monster and one of the earliest milled silver coins a Charles 1st 30 shillings by Can Bill. 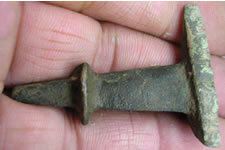 Great artefacts included that Viking Thor's hammer pendant, Celtic woad grinder, enameled Roman brooches found by Cal Jeff, far to many to list. 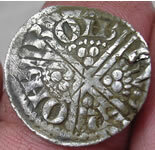 This was our best season for choice and rare hammered gold and silver coins including some great double stuck examples. 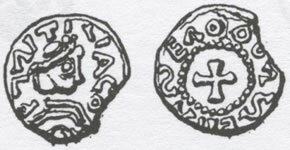 We reported 8 Saxon coins to the Fitzmuseum for registration. 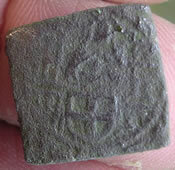 We found another 2 new Celtic tribes visiting this area, Corieltauvi and Eppillus. 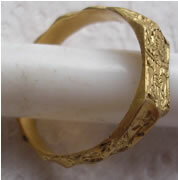 It was an amazing season for gold rings including that fantastic Medieval Iconic and the Knights Templar ring. 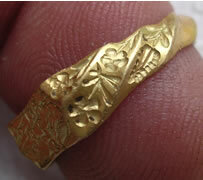 The Roman gold ring was also a stunning find on land we only started hunting since Jan 06. 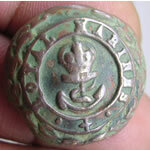 The site where there were prisoners of war working the land from the Napoleonic through to W.W.II produced staggering numbers of superb military finds and is a button hunters dream. 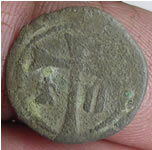 Roman coin finds were lower this season due to our concentration on the new sites which only have marginal Roman signs. Having said all that we hardly scratched the existing sites as we now have around 150 fields to try and cover. 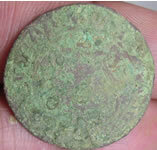 Now it all back to square one as they will all be replouged and refreshed ready for the season start in Sept.
Special thanks to all the specialists like Mark Lehman the Roman coin expert, Dr Philip de Jersey who runs the National Celtic Coin Index, Dr Martin Allen who runs the National database at the Fitzmuseum and Colchester museum for ID'ing and recording all our important discoveries. 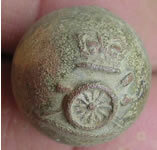 Thanks to Tim Burt our militiary button expert who's on line books and help has been invaluable this season. Thanks to all the very valued membership here for their continued honesty, support and detecting with the best possible practices. 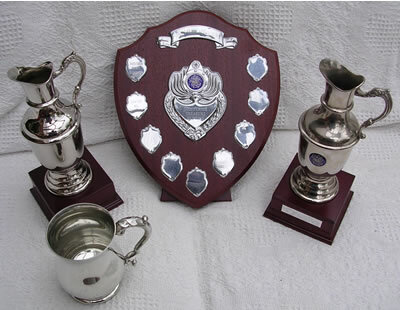 Your long and dedicated work in all weathers has contributed greatly in the history of the local area. Finally the most important guys the landowners, they are a great bunch of folks who allowing us to detect their land even when they are cropped which says a lot to the friendship they have developed with the membership. Now it's time to get on with the paperwork and exporting until Sept, it is going to be a long summer before we get our next fix !! 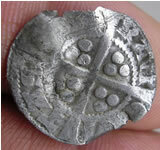 The unusual hammered silver penny posted on the 14th April turns out to be an Edward IV 1461-1470 AD hammered silver penny Durham (CIVITAS DVNOLIN) Type IV Rose in centre of reverse. 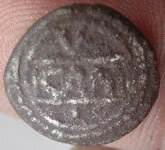 Thanks to the guys on the French forum for their help to ID this coin. 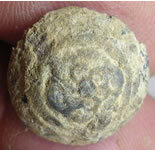 Voting for find of the year is a three horse race this year. 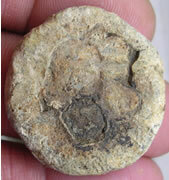 Just under half the votes have been cast so make sure as a member you have your say as to which artefact or coin wins this season. 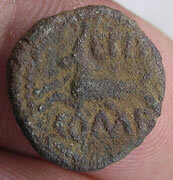 Updated the following pages with the latest finds. 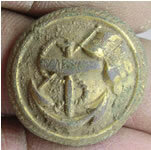 The military finds are now split into sections with a new index. Well that's it now to Sept when all the fields and reploughed and renewed and we are back to square one again LOL . 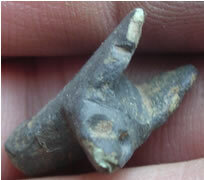 It has been a fantastic season for finds again and now it is time for members to vote for their favourite find of the year from Sept 2006 Page 1 to March 2007 page 8 on the site. 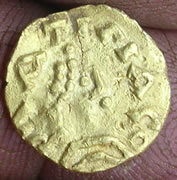 All gold finds were also recorded on the Gold finds all page. Drop me a mail to vote as the winner gets the free weeks trip next year, silver urn and his name on the shield of honor. Congrats to Ohio Tony who wins the Wayne Otto Memorial cup for the detectorist with the best attributes during the season. 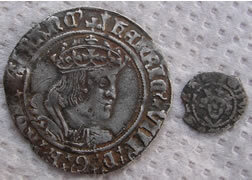 Tony has ears like bat for finding silver hammered coins and he hand reared Yngve the Swede with great results as on Yngve's second trip this season he found 5 hammered silver coins. 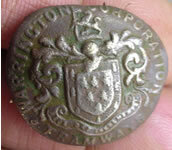 The current prolific coin hunter is still being won by FL Rolo but several export pouches are yet to be counted. 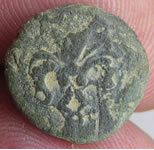 Dr Philip at the Celtic coin index has just sent me the final ID of the 3 Celtic coins found last week, great rare finds. 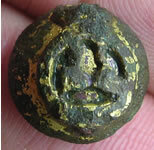 Interesting to note that the wild stater is from the same die as the very first Celtic gold ever found here by Boston Al on a site 4 miles away. 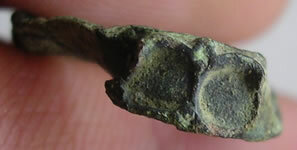 This is a good example of how unique all Celtic gold coins are as these two coins were struck from the same die but are a completely different shape. 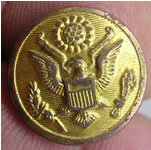 The comparison clearly shows how the gold was placed on the die which was larger than the coin to be made. 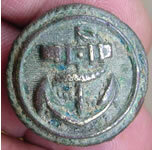 Fascinating finds. 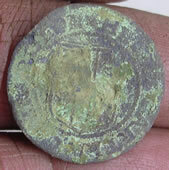 I have still got to post more finds including a very unsual medieval hammered silver long cross penny not in the reference books. 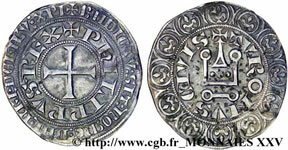 Note the flower in the centre of the cross, unlike those on Henry coins. 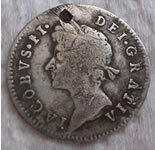 I have sent it off to the French forum guys to see if it is one of theirs. 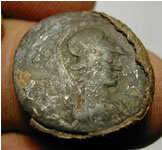 Click on this link to see relics as they are dug in the USA http://treasureoutfitters.com/. Great fun to see them come out of the dirt using a hatcam, produced by mudslideslim. Click on the episodes and watch the videos. 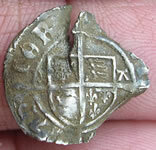 More great hammered silver finds including the very tricky to find cut halves and 1/4's. 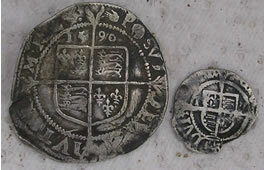 These were deliberately cut for small change in the period. 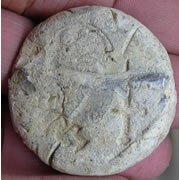 I have posted few more finds to the March 2007 finds page 8. 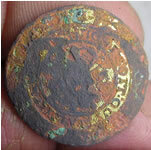 Yesterday's unique Henry coin find is even more unusual as it is in fact a double strike, the first I have even seen on an early hammered coin. 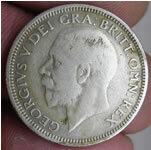 It appears to have been moved through 90 degrees and re-struck hence the two ONB reverse legends and two HENDRIC legends on the obverse, what a neat find. 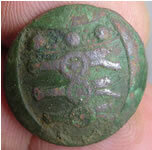 Other great finds include this rare C1480 AD Boy Bishop token for this area, at 26.22mm dia it is a large token based on the long cross groat coin of the period This practice of issuing Boy Bishop tokens was confined mainly to Ely, Sudbury and Ipswich with the main centre Bury St Edmunds. 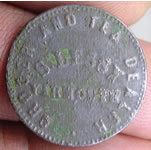 These could be used as alms to buy food and drink at local shops. 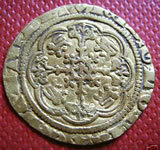 The shopkeeper would have received reimbursement from the abbey. 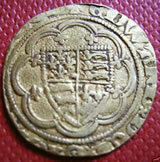 Interesting that the Henry VIII Archbishop Warham coin was found in the same area. 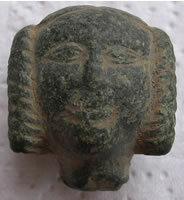 These Ampullae were bought from religious sites around the country. 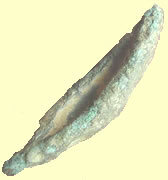 They were filled with either holy water or oils and could be poured on the crops for a good harvest. 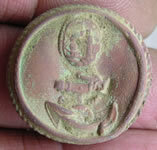 This is an amazing find by Can Rod. 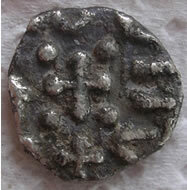 It is a 1247 AD Henry III voided long cross hammered silver penny ( without sceptre type) with a unique front and reverse. 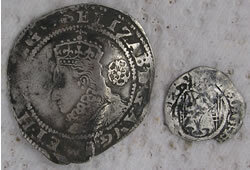 Note the 'one sided beard' on the left to the Kings head. Amazing reverse where the cross goes down at 7 o'clock to miss the O and again at 10 'o'clock . The revere does not match any known type with ONB/ONB ? 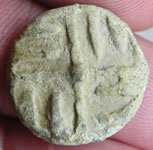 That is usually a Bristol mint and should read WAL/TER/ONB/RVS, great find. 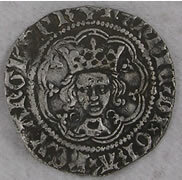 The other Henry III found shows what a normal one should appear like. 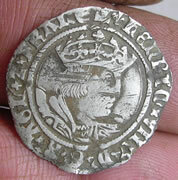 Henry III voided hammered silver penny Obv and Rev does not match any known type, no curls to left side of head - staggered cross ? 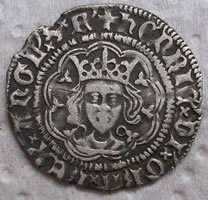 See below for normal looking Henry III. 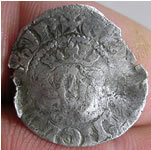 The last hunt of the season is underway and some nice do dads found including this really nice Henry VIII hammered silver groat and that amazing Hammered silver Groat turned into a brooch. Canadian Rod has completed a huge amount of research on the new land and has arrived with a whole series of maps and plots. The new Saxon area we discovered shows two rivers running though it in the past and an amazing huge moated area on anther field. 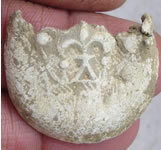 I expect it is French as the back shows a series of Fleur De Lis - Posted it to the French forum to see if they can ID it. I am well backed up with posting pictures as the web server has reached the maximum file capacity and died LOL. I have deleted the whole site and reloaded it and it appears to be working OK but please report any broken links if you find any. It was a complex reload into new folders and amazingly it worked but there are going to be bits that did not auto re-link ! What an amazing start to a new site which is huge with around 15 fields and has another huge bronze age village site at it's center. 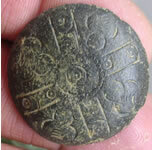 These latest finds brings our total to 60 Celtic gold coins recorded with the Celtic coin register including a whole series of rare ones. 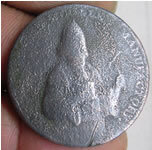 Our experience has shown that these 'offerings' always appear around the village on the land that would have been the crops of that village, very rarely do we find casual coin drops actually on the village itself. If you have a Celtic village site of your own then try detecting the fields surrounding the village which is where we find 99% of the offerings. 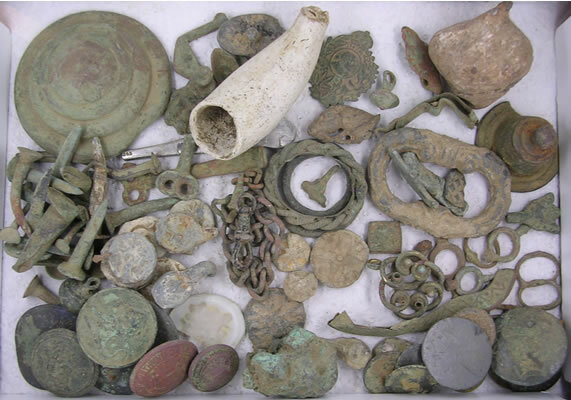 Only on 7 occasions, when we reported hoards to the museum , have they been grouped closely together i.e. multiple offering spots. 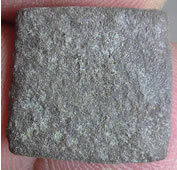 Again experience has shown that they are generally widely scattered up to several fields away from the actual village centre. The 'one off' Tribe finds like the recent Corieltauvi Stater are probably one of the few casual loses from visitors as this area was a huge trading center between tribes. 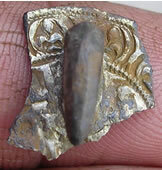 As a guess I would say that 80% of all our gold finds have been intentional offerings and not casual losses. 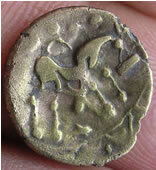 Initial feedback on the latest 2 gold and 1 silver Celtic coin finds from the Celtic Coin Register. Amazingly rare types. 'You've evidently hit a good site here. I'm working away from Oxford for the next week so can't provide exact rarities for these yet, though I can give you a rough idea. 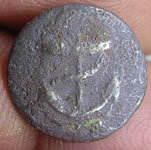 CCI 07.0180, the quarter stater: this is the type sometimes inscribed 'A', as here, and sometimes 'AGR'. 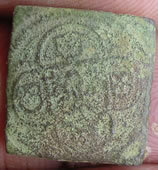 There is no real agreement on what AGR means, but it might possibly be a son of Cunobelin - so issued in the short period between Cunobelin's death and the conquest, perhaps. Or it might be some other word, not necessarily a personal name. These are not common - not more than a dozen, from memory. 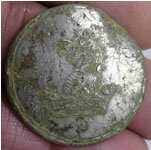 The type is not listed in VA.
CCI 07.0181, the stater: actually a wild type, I think, VA 1931, with the rather doglike head on the horse. 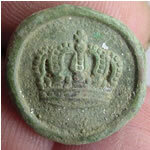 So on current thinking perhaps from the middle of Cunobelin's reign, say 20s AD. 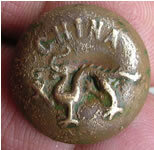 CCI 07.0182, the silver unit: another rare one, and another which isn't in VA or in the BM catalogue. Again from memory I think we have about 8 or 10 of these. 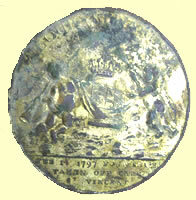 The obverse as you can probably see has CAM in the panel and then V above and L below; the reverse is a crouching dog with CVNO in the box below, if I remember rightly. 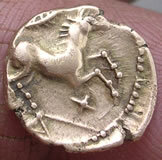 The animal is very similar in style to the 'wild' horse so it probably dates from the same sort of period. Many thanks for these - obviously a very interesting site. We don't seem to have any others recorded from that area, at least not till the end of 2004 which is what I can easily search'. 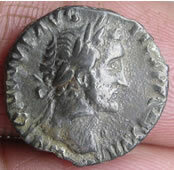 This Antoninus Pius Roman find was protected by a thick layer of 'horn silver', a thick crust that can grow on old Roman silver coins which can make the find look initially like a grotty bronze coin. 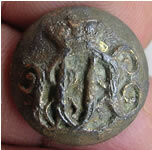 Always test the edge on what appears to be a bronze grot to see if any silver shows through. 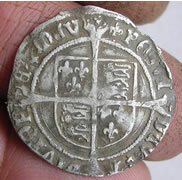 Pick the 'scab' with your finger nail and wooden toothpick so not to scratch the silver underneath. 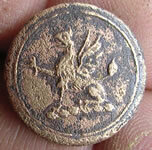 Mark Lehman has sent us an interesting ID of the coin. 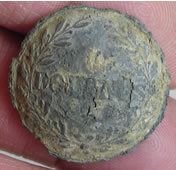 Below is a picture of a Roman Imperial silver coin with pictures of the 'scab' and the coin underneath. 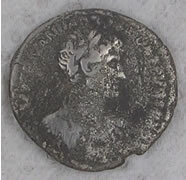 'It's Antoninus Pius, 138-161 A.D. - His connection to you and the island is that he built the 2nd wall, the wooden one north of Hadrian's. 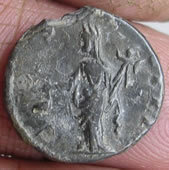 This is a silver denarius, as I'm pretty sure you already knew, this one was minted in 153/4 A.D. at the Mint of Rome. 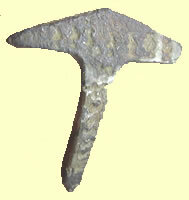 Obv: IMP ANTONINVS PIVS PP TR P XVII. Laureate head right. Rx: COS IIII. 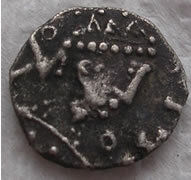 Vesta standing left holding simpulum (ceremonial ladle) and palladium. 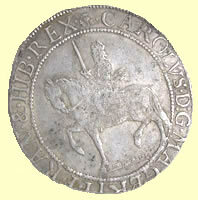 RIC III # 239a, RSC 198, Cf. SR 4065, VM 18/1. Pretty spiffy stuff these days. 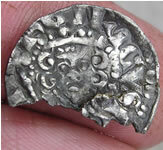 Another excellent find from a new site is this very unusual Celtic silver unit of the 'King of Colchester' Cunobelin. 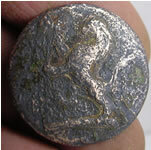 Celtic silver is very rare in this area as 99.9% of Celtic coin finds are gold coming from a very wealthy Celtic trading area. 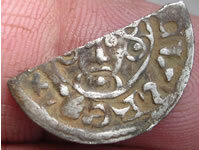 This is only our 4th Celtic silver unit ever so it is a very rare find. 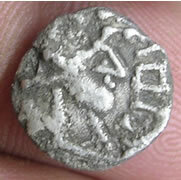 Cunobelin - Son of Tasciovanus, father of Adminius, Togodumnus and Caratacus. During the last years of his father's reign, he invaded the territory of the Trinovantes and subdued them, probably prompted by the news of Rome's loss of Varus' three legions in Germany in AD9, and therefore fairly confident that his action would go unpunished. 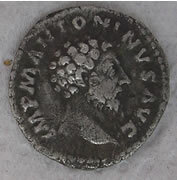 He continued to rule over the Trinovantes from Camulodunum (Colchester) by dint of his own resources and retained his seat of government there when he succeeded to the Catuvellaunian throne upon the death of Tasciovanus in circa AD10. 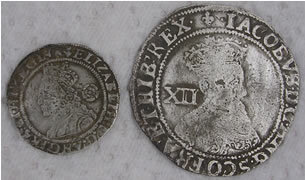 He became 'the first British statesman,' and through diplomatic means, probably had his kingship over the joint Catuvellaunian/Trinovantian kingdom ratified by Rome, for some of his later coinage bears the title 'REX'. 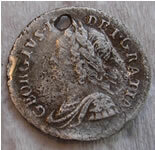 He continued to rule the combined tribes from Camulodunum for many years, and his capital became the focal point of British politics, learning and trade. 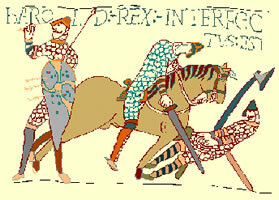 Suddenly, in c.AD40, he was enfeebled, possibly due to a stroke. 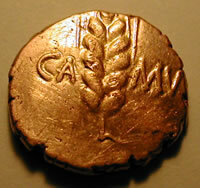 Subsequent military actions by his sons Togodumnus and Caratacus, who swept throughout south-east Britain deposing first their own brother Adminius (who had pro-Roman tendancies) from Cantium, then their old adversary Verica of the Atrebates, brought the attentions of Rome. 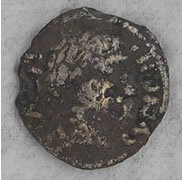 Cunobelin died shortly before the coming of Rome c.AD42. 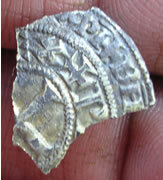 'CCI 07.0182, the silver unit: another rare one, and another which isn't in VA or in the BM catalogue. Again from memory I think we have about 8 or 10 of these. 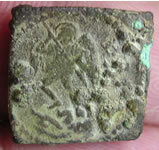 The obverse as you can probably see has CAM in the panel and then V above and L below; the reverse is a crouching dog with CVNO in the box below, if I remember rightly. 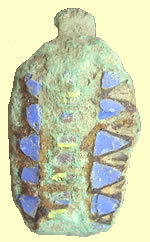 The animal is very similar in style to the 'wild' horse so it probably dates from the same sort of period'. 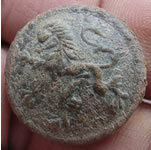 I have a ton of other finds to upload yet like this Roman looking medallion or it is an 18th token ? 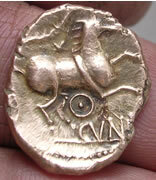 I have sent it off to our Roman expert for his opinion. 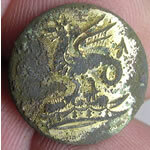 More great finds from the new land we are still trying to hotspot is these two 'King of Colchester' Cunobelin Celtic gold staters and both are stunning examples. 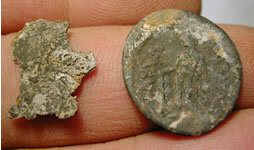 These coins date from 10 to 40AD and are distinctly different types. This site is huge and is several miles from our existing Celtic village sites. 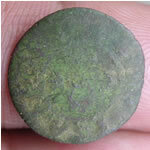 I have sent both of the staters off to the Celtic coin index for recording and registration and for Philip's comments and ID. 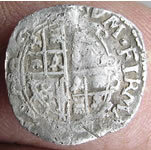 Other great finds include some excellent medieval hammered silver coins and one of them is a very rare Bury St Edmunds mint. 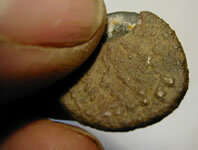 I have posted a bunch on the latest finds page March 2007 finds page 8 with tons more to follow including an Roman silver that I have yet to send to our Roman expert for his comments.